LAS VEGAS – The currents that sweep through the river of a freestyle bullfighting arena can be fast and swift. When in control, the men in the battle can maneuver the rapids well and avoid the jagged rocks. But the bulls can come in on a rush and overtake the situation, and the paddles that propel the bullfighters can be lost in the torrent. Andy North is the life raft that comes in at the right place and the right time, bringing everything into safety. 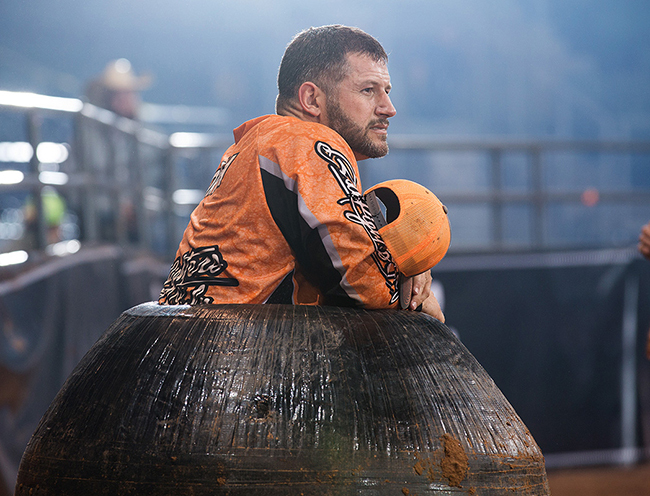 He’s the barrelman for the Bullfighters Only Las Vegas Championship, which takes place Dec. 1-3 and 7-10 in Las Vegas. He’s earned the right. He worked seven BFO bullfights this year, including the Cavender’s Cup, which was just the second stand-alone event in Bullfighters Only history. That’s why his role is so important to the bullfighters. They can utilize the barrel during the fight, and they know the life raft is just steps away if they are swimming for safety. While that’s vital, the best part of the job comes with his vantage point. “I have the best seat in the house,” North said. “I’m right there with those guys, and I get to see and experience their bullfights with them. It doesn’t have to be a hellacious barrel save. What I like most is getting to witness something glorious, being part of it and being close to it. Freestyle bullfighting has been around for years, but Bullfighters Only has marketed and produced the game to expand interest in it. It’s working. The Las Vegas events will serve as the one-year anniversary of the first BFO fights, so the interest is there. Additionally, and maybe more importantly, this year the BFO will crown the first true freestyle bullfighting world champion in more than 16 years. Bullfighters Only showcases the top talent in the industry. “People will be on the edge of their seats,” North said. “For somebody that’s never seen it, it’s so fast and so electric. It’s action-packed. There’s part of it that’s unknown, and you don’t realize how quickly things can go south. I think that keeps you involved and ready for anything. It gets even bigger in the City of Lights. Las Vegas is well known for having world-class bouts. Now Bullfighters Only is producing another world-class fight for all to see. “That money’s big,” North said of the $50,000 purse. “I think the location is a big thing. The venues are awesome. I think being the time of year – during the same two weeks as the National Finals Rodeo – is one of those things that makes it a true highlight. Everybody’s going to come in and be ready to go. So will everyone else that makes it part of their time in Las Vegas.